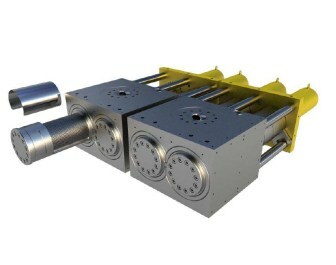 Maag announced recently that it has delivered a tailor made screen changer filter design for world’s largest PET production line based on Uhde Inventa-Fischer’s MTR (Melt-To-Resin) process. Completed in 2012, the additional manufacturing facilities in the Middle East boost a total additional capacity of 500,000 tons of PET bottle grade resin per annum. The plants have seen the deployment of the largest Melt-To-Resin reactors in existence, with Maag also providing a complete range of melt pump equipment. The reactors are now joined by a number of continuous screen changers, whose patent pending arched filters maximize the filtration surface available, which guarantees low melt residence time, especially in high viscosity resin applications, yet they incorporate a compact footprint. Arched filters are a logical development based on supersized screen changers, but utilize “one way filters”, that can be disposed of after use, explains the company. This in turn eliminates the entire process of cleaning the candle filter bundles, which normally involves vacuum ovens, acids, solvents and subsequent bubble point tests to determine if the filters are still useable. Maag adds that changeovers now take less than 10 minutes, with only one operator, without requiring cranes or complex tools. Depending on the melt contamination (solid or gel), the screens can be made out of Woven Wire Mesh (WWM) or Fiber Metal Melt (FMM).